You have questions about iTunes. Kirk McElhearn has answers. 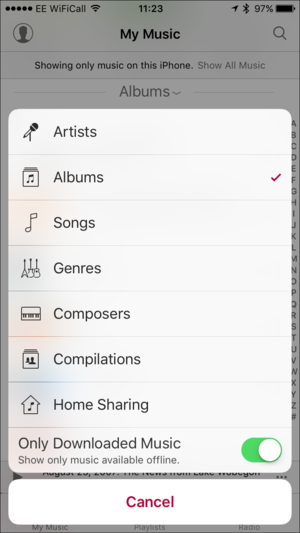 When Apple updated iOS 9.3 recently, they made some changes to the Music app. One of these changes is the way you rate songs you’re listening to; I explain how you do this now. I also look at how you can show or hide music in the cloud on your iOS devices, and answer two questions about getting lost in iTunes. How can I hide music in the cloud on my iPhone? Q: In addition to music that I’ve synced from iTunes to my iPhone, the Music app displays everything I’ve bought from the iTunes Store. 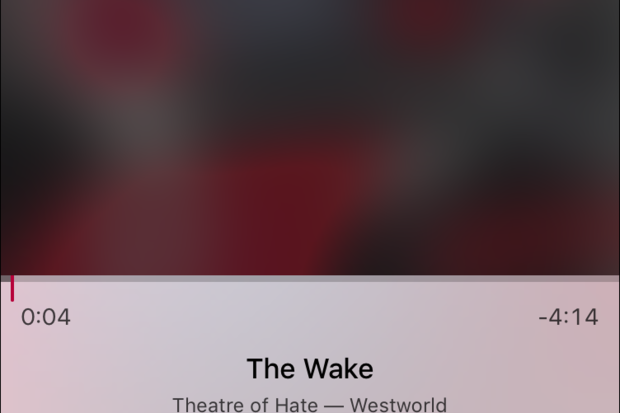 How can I make these songs go away? Toggle the button at the bottom of this menu to show or hide music in the cloud. There used to be a setting in the Settings app, under Music, to show or hide music in the cloud. This setting affected music purchased from the iTunes Store. But when Apple added Apple Music and iCloud Music Library, they moved this setting, placing it in a pretty obscure location. 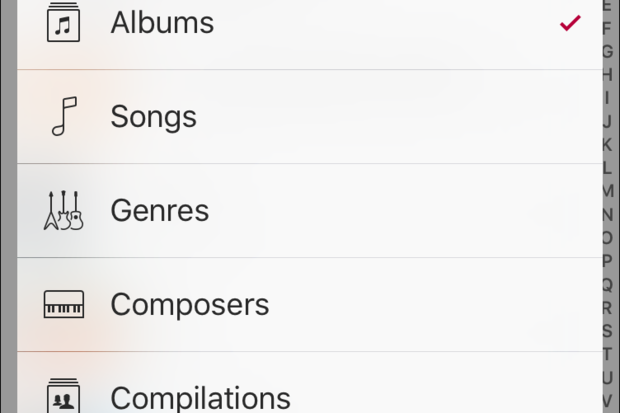 To toggle the visibility of music in the cloud—whether it’s purchased tracks or music in your iCloud Music Library—go to My Music, then tap on the red sort menu. It might display Artists, Albums, Genres, Songs, or something else. At the bottom of the menu that displays is a toggle to show Only Downloaded Music; tap this button to activate this setting. You may want to do this when you’re out and want to listen only to music that’s on your iPhone, rather than stream music, if you don’t have enough data on your phone contract, or if you’re in an area with no coverage. When you activate this setting, Apple reminds you by permanently displaying a line of text at the top of the app, when you’re at the top level of My Music, saying “Showing only music on this iPhone.” Tap Show All Music to toggle the setting back without going into the menu. How do I rate songs in the iOS Music app? 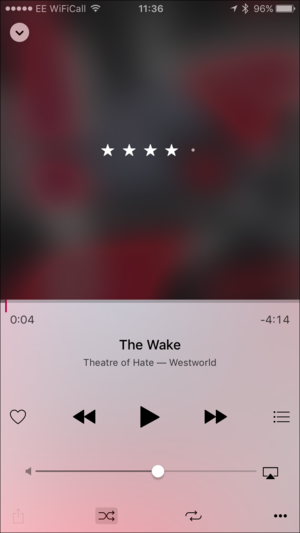 The rating control in the iOS Music app is now hidden behind album artwork. Q: The latest iOS update (9.3) seems to have removed the ability to rate songs playing on the iPhone as you described in a previous iTunes Guy column Is there a new way of doing it I haven’t found? Indeed, Apple changed the way you rate songs in the iOS Music app in iOS 9.3. It’s not hard to find, but like many such features, you have to look in the right place. Just tap the artwork while a song is playing. The artwork will blur, showing a series of five dots, or stars and dots, if you’ve already rated a track. Just tap one of these dots to rate a track, or tap just to the left of the dots to remove a rating. Note that if the song you want to rate contains lyrics, then the rating dots and stars display at the top of the screen, above the lyrics. How do I go back from the iTunes Store to what I was listening to before? Q: Sometimes I’m listening to music, and I wonder if the artist I’m listening to has released any new music. I go to the iTunes Store to check, I play some samples, and then I want to go back to what I was listening to before. Is there an easy way to do this? Yes and no. If you listen to samples in the iTunes Store, then want to go back to what you were listening to before, you can click the Up Next icon in the iTunes LCD (that’s the display at the top of the iTunes window.) At the top of the Up Next list, you’ll see Music Playback is Paused, with a Resume button next to it. You can return to a playlist or album you were listening to after perusing the iTunes Store. Unfortunately, this doesn’t return you to the track you were playing, but to the next one in the queue: the next track in the playlist or album you were listening to. So if you had just started listening to a song, and you want to go back and hear it, you’ll have to find it again. How do I find which playlist is playing? Q: I have way too many playlists, and sometimes I cannot remember which playlist is playing? Is there a way to identify the playlist that I’m currently listening to? 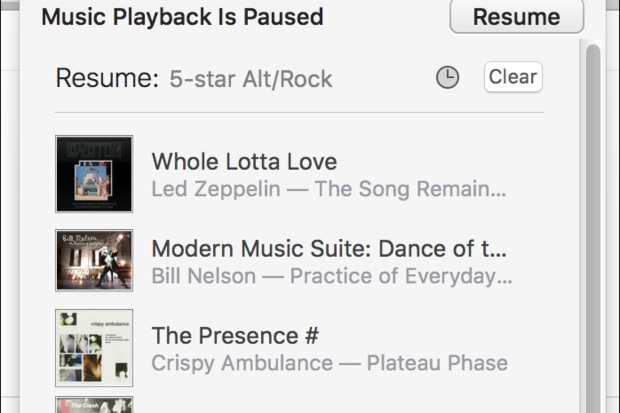 Press Command-L (or Control-L on Windows), and iTunes takes you to the currently playing song, in the location where you started playing it. 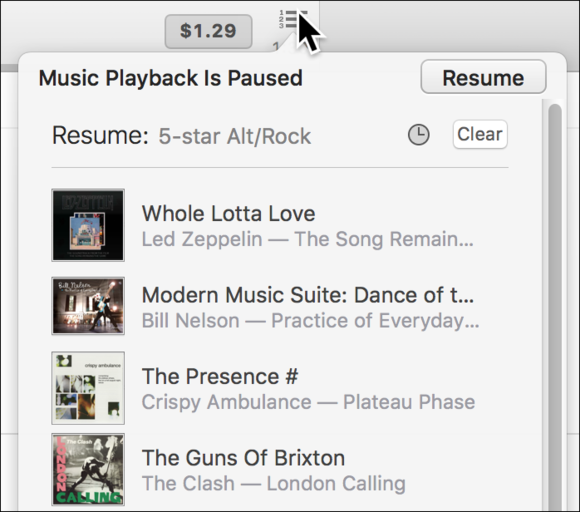 So if you started playing a playlist, and forgot which one, iTunes will zap you back to that playlist and highlight the song.